The Radford women’s basketball team needed an 11-0 run to start the fourth quarter to overtake Presbyterian College and escape with a 48-43 win at the Templeton Center on Saturday afternoon. 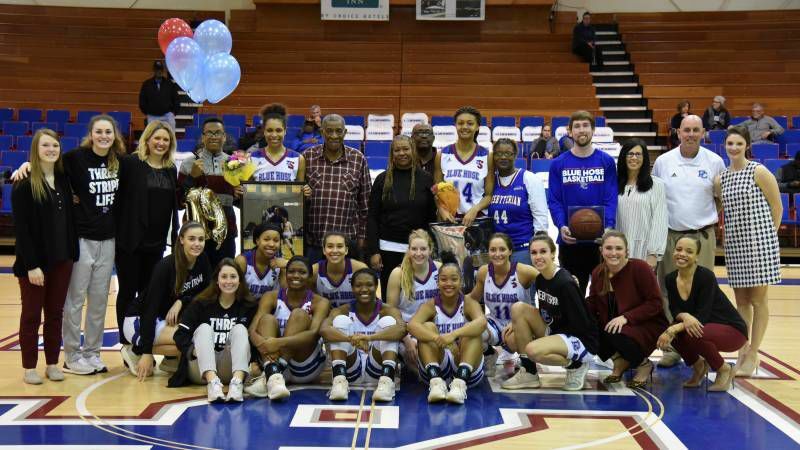 Freshman Trinity Johnson scored a career-best 24 points to lead the Blue Hose, while Sydney Nunley (15 pts, 11 rebounds) and Lydia Rivers (15/10) had double-doubles for the Highlanders. Johnson scored 16 points in the first quarter and was 3-4 (.750) from behind the arc. The Blue Hose outscored the Highlanders 15-2 over the final 6:26 and held a 21-11 lead after 10 minutes. Radford started the second quarter on a 6-0 run with baskets from Nunley and Rivers to cut the lead to just four, 21-17, at 8:42. A three-pointer from Riley Hemm made it 24-17 with 6:29 to play, and PC outscored Radford 6-2 over the last 6:06 in what was a low-scoring quarter to enter halftime up 27-19. Radford took its first lead since 4:53 of the first quarter after scoring 11 unanswered in the fourth to give the visitors a 37-35 lead with 6:10 to play. Nunley and Rivers combined to score all 11 points on five layups and a free throw. Salina Virola tied the game with a layup at 4:47, and PC regained the lead with a basket from Bria Gibbs at 4:15 that made it 39-37. Radford’s Destinee Walker hit its only three of the game at 4:00 to put the visitors ahead at 40-39, and the Highlanders pulled away. Presbyterian College finished the regular season at 6-23 (4-14 Big South) while Radford improved to 23-6 (17-1). The Blue Hose visit Winthrop in the first round of the conference tournament on Tuesday night at 7. 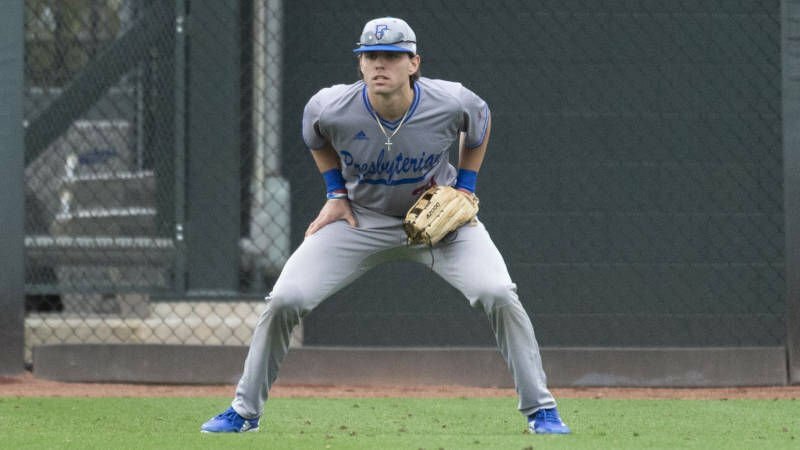 The Presbyterian College baseball team lost a pair of contests at Georgia (14-2) on Saturday as the ninth-ranked Bulldogs completed the three-game sweep of the Blue Hose. The Saturday scores were 7-6 and 8-1. In the opener, Presbyterian (6-9) once led 6-3, but the Bulldogs responded in the bottom of the eighth with four runs, capped by a two-run single and a Blue Hose wild pitch to take a 7-6 victory. The Blue Hose stay in Georgia for a pair of midweek match ups with Kennesaw State on Tuesday and Wednesday with 5 p.m. first pitches set for both games at Kennesaw. PC softball split a pair of games on Sunday to conclude play at the JU/UNF Spring Break Challenge. The Blue Hose defeated La Salle a second time on the weekend in the first game, 3-1, and then fell to North Florida in the second half of the twinbill, 2-1. PC is now 6-16-2 on the year. The Blue Hose used a two-out rally in the bottom of the first inning to jump ahead of the Explorers. Jonnie Petree led off the inning with a leadoff single, but the next batters would not reach base. Casey Gerhardscored Petree with a double to center field. Following a Chelsea Lyons single, Kiley Kross brought in Gerhard with a single of her own to make the score 2-0. Lyons had a big game for the PC offense, collecting a hit in each of her three at bats. She sent a triple to the right-center field gap in the fifth, her first of the year. Lindsay Harris also had a multi-hit game for the Blue Hose, collecting a pair of singles in the win. Alyssa Batastini picked up her fifth win of the season on Sunday after pitching her seventh complete game as a Blue Hose. In 21 innings of work this weekend, the redshirt junior allowed only five runs on 14 hits. Against the Explorers on Sunday, she allowed just five hits and gave up the lone run. Petree added an insurance run in the bottom of the sixth when she laced a double down the left field line and then was able to score on an ensuing fielding error, making the score 3-1. Presbyterian College guard Trinity Johnsonof Hopkins has been named the Big South Freshman of the Week. Johnson averaged 21.0 points and shot just over 40 percent from the field in a pair of Big South contests last week. The guard opened with 18 points, six rebounds and five assists in a narrow road setback at Gardner-Webb on Wednesday. She then added a career-high 24 points including three 3-pointers, against regular-season champion Radford on Saturday. The PC men’s and women’s cross country teams competed at the Coastal Carolina Invitational. PC men and women competed in the 1500-meter and 5k, and members of the men’s team competed in the 4 X 800-meter relay. This was the first time that the Blue Hose competed in the 5k and the 4 X 800 relay as a Division I program. Zack Kochert led the men’s team in the 1500 meters, finishing in 4:28.50. He was followed by Neel Taber and his time of 4:36.08. Classmates Kiro Morkos and Luke Harmon crossed the line at 4:43.72 and 4:46.05, respectively. Justin Nobles rounded out the men’s team, finishing in 5:28.70. Julia Keen took part in the women’s 1500-meter, clocking a 5:54.13. Ali Bennett and Abigayle Winn raced in the 5k for the Blue Hose. Bennett tallied a time of 20:47.45 and Winn finished the race in 26:23.71. Harmon competed for the men, crossing the line at 18:01.21.